Simple to use – drag, drop and click convert – Smart Converter Pro looks after the rest. Batch processing – queue up and convert as many files as you like in one go. Supports 100s of media formats and converts to all your favourite devices and file types, including AppleTV, iPhone, iPad, Android, PSP and PS3. It’s So Smart – only converts stuff that needs converting, and leaves the rest alone–this means it’s very fast and maintains the highest possible quality of video and audio. iTunes Savvy – auto imports your converted video and music to iTunes. Fixed a bug that would make it look like your conversions had stopped. Tipard Video Converter Platinum 3.8.29 – Convert Any Video. 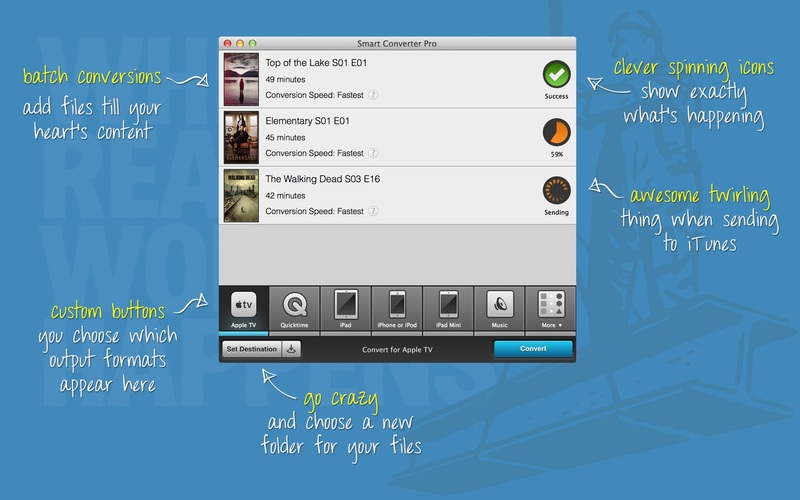 Easy Video Converter Pro 2.1 – Video converter.